Radiator hoses are connecting elements between radiator and the associated aggregates. They are subjected to permanent vibration, as well as fluctuating temperatures and operating materials in their area of application. 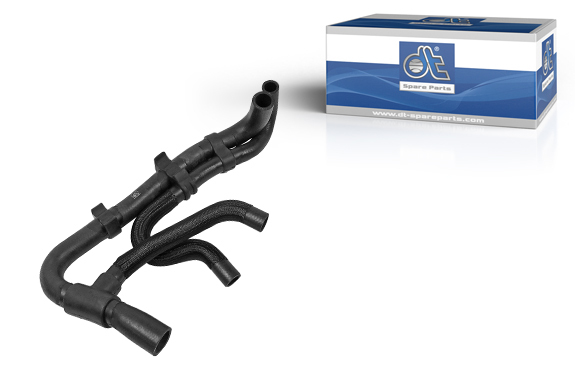 Radiator hoses of the brand DT Spare Parts are characterised by elasticity, stability and a long service life. The hose consists of precisely manufactured individual components that are perfectly matched to each other. The abrasion protection provides additional durability. Strictly defined dimension specifications and tight tolerances are maintained to ensure optimum flow. We recommend replacement of all necessary mounting clamps when replacing the article. If the disassembled article shows signs of abrasion or leakage due to a strained installation position, the mounting location must be checked. It is important to check the operating material for contamination, e.g. by engine oil or Ad-Blue. In the event of contamination, cleaning/flushing of the cooling system must be carried out. The article must be mounted without tension with the appropriate clamps or holders. Unapproved clamps can damage the article and a leak may result. After the test drive, a further leakage test should be carried out. The installation position is also to be checked.